A weapon is a tool for self-protection but it can be abused or used to harm others through the carelessness of the owner. There are many ways to keep the weapon from falling into the wrong hands. The Armatix pistol comes with a wristwatch that will not fire unless the watch is worn on the wrist of the person who pulls the trigger. While this may not totally prevent abuse, there is less possibility of a mischief-maker getting his hands on both the pistol and the watch at the same time. The Armatix pistol is a smart weapon that utilizes wireless technology to improve gun safety. The .22 caliber pistol is designed to receive a wireless arming signal that allows the gun to fire when it is within a few inches of the accompanying wristwatch. The LED light at the back of the weapon will turn green to indicate to the user its readiness to fire. 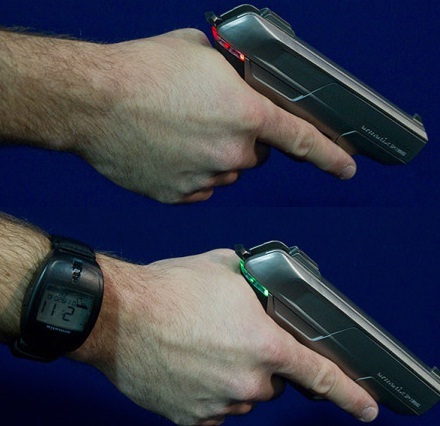 On the other hand, the LED light will turn red when the watch is not detected and the gun will not fire. This limited edition smart pistol retails for $9,700.